So I agree that dessert is a treat and should not be enjoyed every single day, but there is absolutely no reason we can’t indulge in delicious, filling and truly nourishing desserts, made from healthy ingredients. Plus, when you switch to these kinds of desserts, you can eat them more frequently, while also ditching the dreaded sugar hangover. Major win! When I first embarked on a healthier lifestyle and discovered the wonderful world of wholefoods, I was amazed to find that desserts can be both delicious AND good for us. It doesn’t have to be one or the other. Let me introduce you to my newest bestie, Baked Apples. This dessert ticks all of the boxes in my eyes, since it is gluten free, refined sugar free, dairy free and most importantly, actually tastes amazing. These guys are stuffed with nuts, seeds, dates and coconut, which ensures that we are not only avoiding all of the junk, but also loading up with good fats, plant protein and delicious fresh fruit. 1. Pre heat your oven to 180C (fan forced). 2. Using an apple corer, remove the core from both apples. 3. In a mixing bowl, combine the chopped dates, pecans, pepitas, buckwheat, shredded coconut, coconut oil and the zest of ½ orange. 4. Stuff the apples with most of the nut filling, packing tightly. Reserve a small amount of the nut mixture. 5. Place the stuffed apples into a lined loaf tin and squeeze the juice of ½ an orange, along with a drizzle of boiling water around the apples. 6. Bake for 35 minutes, or until they start to soften. 7. 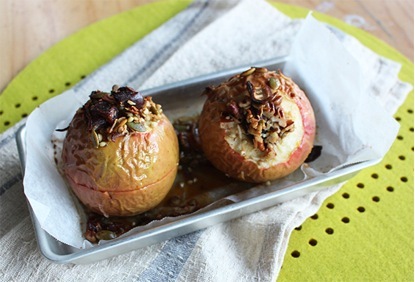 Remove apples from the oven and sprinkle with remaining nut mixture before returning to the oven for a further 15 minutes, or until the apples are softened. 8. Drizzle the pan sauce over the apples and serve with Greek or coconut yogurt.